Let’s talk about the weather for just a moment. Because this year we had a crazy early snowfall, and it caught me off guard. Most of my neighbors and pretty much everyone I’ve talked to has been in a similar predicament. The snow fell on top of a lawn covered by unraked leaves. Apparently there were some people who bagged their leaves early. But the snow covered the leaf bags, and when the city tried to collect them, the bottoms fell out leaving leaves all over the snowy yards. Well, for the past few days we’ve been experience melting conditions. So yesterday afternoon, I took the some time off from working, and decided to do some heavy duty raking, spending over three hours using muscles I only use maybe once or twice a year. When it was all done, I soaked my aching muscles in a hot bath, and treated myself to the last cold SingleCut beer in the fridge. Tomorrow is December 1. We’re still several weeks away from the heart of winter. And once again it’s supposed to stay above freezing all day, without any precipitation. 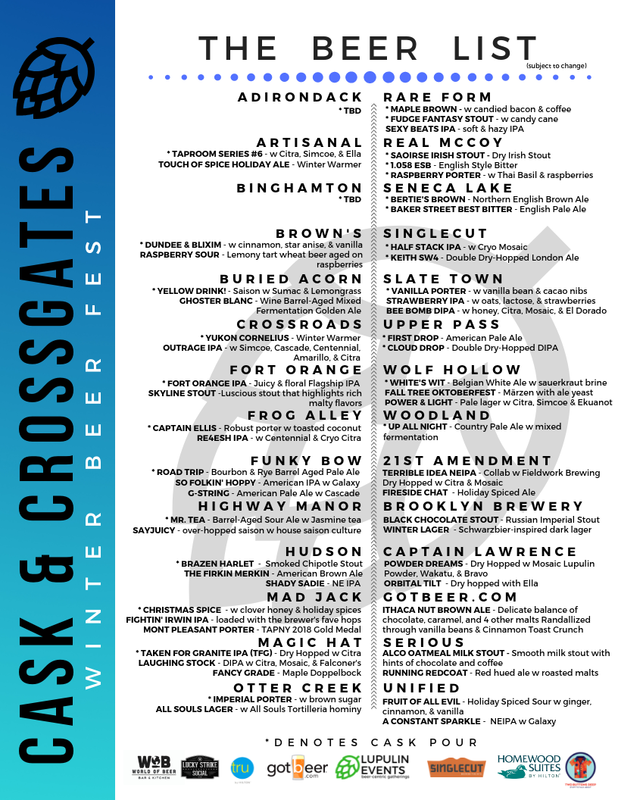 But one of the reasons I worked so hard yesterday is so I can play tomorrow at the Cask & Crossgrates – Winter Beer Fest. There are a few things I’m really looking forward to trying. Today’s exercise on the blog is mostly for my own benefit. By going through the beer list, and writing down the short list of casks I want to try most, it will help me manage the fact that there is far too much beer to sample within the constraints of the festival. But I am also curious to hear about other people’s top picks and to see how they are different. To make it easier to follow along at home, I should probably show you a copy of the beer list. My list of must try casks may look very different from yours, and I’ve learned that’s okay. If everyone liked the same kind of beer, we wouldn’t have this incredible diversity of breweries. But fundamentally, I’m a simple man, with simple tastes. While I’m still a fan of those citrus and tropical fruit flavors coaxed from hops in India Pale Ales, I’m also starting to grow weary of them. And typically, I’m not such a fan of beer with stuff in it. Although I have to confess about enjoying the Great Flats beer made with Cinnamon Toast Crunch, even though I wanted to hate it. In part, this is where the problem lies. You never know if you’re going to like something until you taste it. But in a festival setting you still can’t taste them all. Which is why for this festival, I’m prioritizing those breweries bringing more classic British styles which may shine even brighter as a cask conditioned ales. I can’t wait to spend the afternoon drinking some of these brews in heated tents on Saturday. Just know this. Today is the last day to purchase tickets for $45. At midnight ticket sales stop, and the only remaining tickets will be sold at the door for $55. Looking forward to seeing some of you there. Of course, I’ll be decked out in Yelp gear, because I’ll be giving away pairs of Yelp Life fingerless gloves. But I’ll also be rocking a very special hat. If you’re not able to join us in person, tune in over social media, and you might catch a glimpse. The raspberry porter from real McCoy and the Mr. Tea for casks. The Running Redcoat also sounds interesting. Have fun!